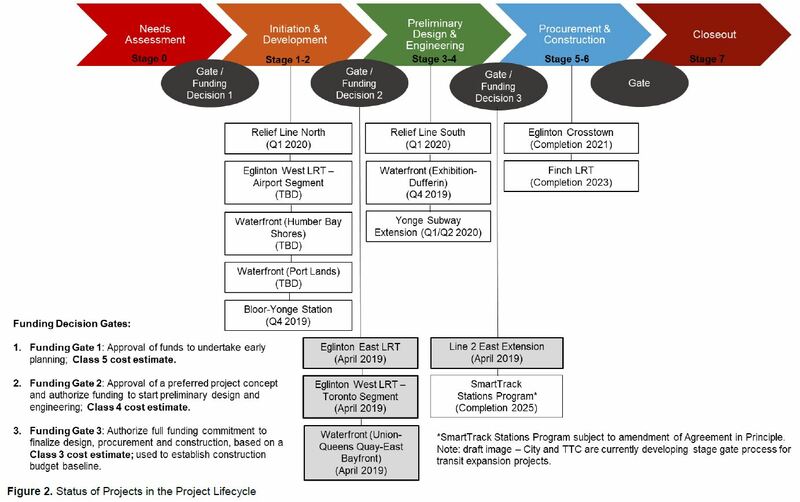 On April 9, Toronto’s Executive Committee will consider a massive set of reports on the many transit projects at various stages of design and construction in Toronto. In Part I of this series, I reviewed the financing scheme for four major projects as well as details of the Scarborough Subway Extension, aka the Line 2 East Extension. In this article, I will review the Relief Line, SmartTrack and the Bloor-Yonge Station Expansion project. 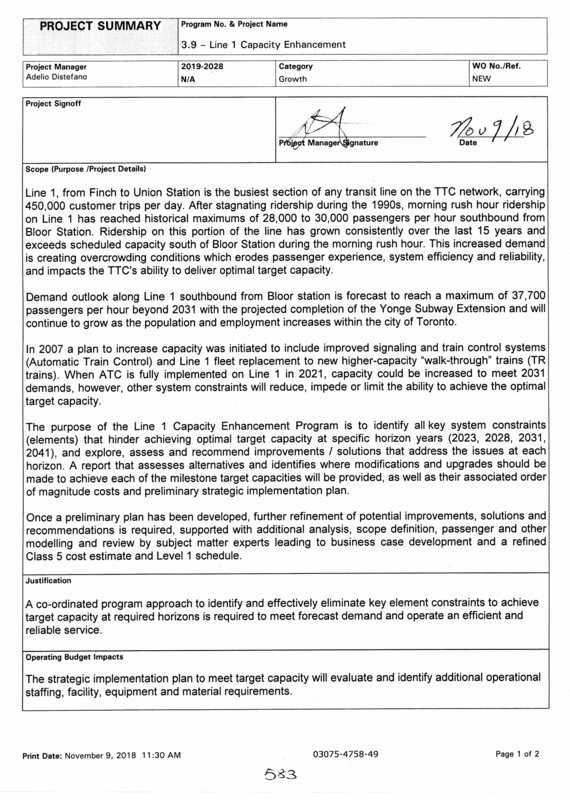 There are related reports about signalling and capacity expansion of Line 1 Yonge-University-Spadina in the TTC Board’s agenda for their April 11 meeting. I will deal with these in a separate article. After decades in which the focus of transit planning looked outward to the 905 beyond the bounds of Toronto, there is now a political realization that capacity into the core is a major issue for the region’s economy. Politicians and planners may show optimistic studies of suburban centres and growth, but the development industry, a bastion of free enterprise thinking, persists in building downtown because that’s where they can sell at the greatest profit. The Relief Line, SmartTrack, Automatic Train Control, subway station expansions and even surface transit projects like the King Street Pilot all attempt to address the demand for travel to and through the core area. Looking beyond the city boundaries, there are subway and GO Transit extensions and service improvements. Some of these schemes are more successful than others, and some have very long lead times before any benefit will be seen. Political attention has shifted from the fights over which one project will be built each decade to the recognition that many projects must occur in parallel so that capacity can catch up with latent and growing demand. Planning for many transit projects in Toronto has been underway for years, but the public face of this work took a long holiday in 2018 thanks to elections at both the provincial and municipal levels. In coming weeks, Toronto’s Executive Committee and then Council will consider an omnibus report that provides updates on many transit projects and recommends a path forward. Today, that path is murky given uncertainty about provincial intentions and the degree to which consultation between the city and province is actually in good faith. Premier Ford’s approach on other portfolios, coupled with the breezy confidence of his Transportation Minister (seen recently on TVO’s The Agenda), do not bode well. With the arrival of Doug Ford at Queen’s Park, the provincial goal on transit is more about settling old scores with Toronto Council and proving that Ford’s transit vision is correct than it is about good planning. Recent correspondence between the province’s special advisor on a proposed subway takeover revealed just how much the province does not know, or chooses to ignore. This was not a good start and the province wounded its credibility on basic technical points, never mind the political context. But for a moment, let us consider Toronto’s future from the point of view of what the city hopes to do, if only they have the control and the money to pull this off. The report is long, and to break this article into digestible pieces, I will focus on groups of issues. 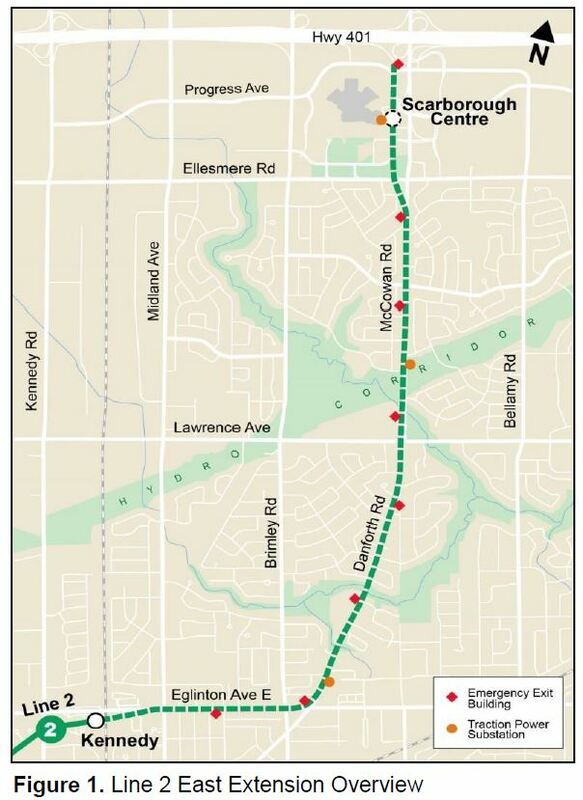 This article covers overall financing of the transit expansion project and specific details for the Scarborough Subway Extension (SSE), now known as the Line 2 East Extension (L2EE). I will turn to other components of the plan in further articles. The most challenging part of any transit project, let alone a complex program, is to obtain funding from governments whose priorities do not necessarily align and which may talk at least as much about the sanctity of “taxpayer dollars” as they do about investment in public infrastructure. In a media briefing, city staff were quite clear that no project can proceed to the stage of contract tendering and awards unless the contribution agreements underpinning a project are in place. At the federal level, the primary funding source will be the Public Transit Infrastructure Fund (PTIF) which has two phases. An initial phase was time-limited, and was used in Toronto mainly to fund the purchase of hundreds of new buses. The second, longer-lived phase of PTIF will be used for transit construction projects. There is some urgency to nail down PTIF contributions given the fall 2019 election and uncertainty about this program under a new government. Note that this entire discussion relates only to projects that would be funded in part through PTIF, not to many others such as the Eglinton LRT extensions or the Waterfront LRT. Negotiations with Ontario are ongoing, and the status of projects and associated $4.04 billion in provincial funding is unclear. This could be clarified in the provincial budget to be announced on April 11, 2019. Provincial interest in and plans for the Scarborough extension and the Relief Line will affect both of these projects. PTIF2 has an assumed split of 40-33-27% for the federal, provincial and municipal governments respectively. This creates a breakdown of responsibilities as shown below. The provincial share is supposed to be “new funding” and the amount here does not include prior commitments to Scarborough transit which originally were for the proposed LRT line, later for a subway. Exactly how much Ontario will contribute remains to be seen given discussions about ownership and the scope of the Scarborough subway project. I will return to this in more detail later. 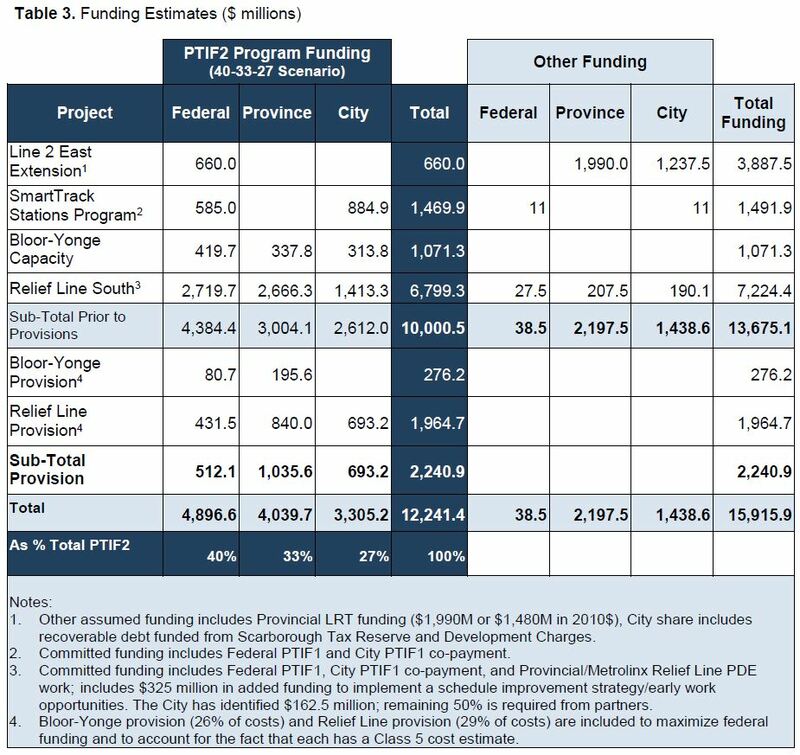 Within the city share, $2.42 billion is unfunded (no revenue sources have been committed to fund/finance the expense), and only $885 million of the SmartTrack Stations Program has city funding. The report recommends that the city’s CFO and Treasurer report prior to the 2020 budget process on strategies for addressing the shortfall. The possible funding arrangements vary for each project, and these are complicated both by past history and by the uncertainty of early “class 5” estimates. A tentative breakdown is shown below, but this must be taken with a grain (or more) of salt due to technical and political uncertainties. For example, the assumed provincial contribution to the Line 2 Scarborough project is based on inflation of a commitment made in 2010 dollars where the city and province do not agree on the appropriate inflation factor. Two separate numbers have been used for the Relief Line cost estimate: $6.8 billion in Table 2 above, and $7.2 billion in Table 3 below. In the media briefing, TTC staff explained that the change was due to an alignment revision (Carlaw vs Pape) and changes in construction techniques (mining vs cut-and-cover) at some locations. That may be so, but to have two different numbers for the same project so close together within a report makes one wonder about the care taken in other aspects. On top of that is almost $2 billion as a “provision” for the Relief Line to guard against potential cost increase as the estimate is refined from class 5 to class 3. This sort of uncertainty is not unusual, but the constant variation in quoted “estimates” makes for no end of problems. The converse is seen with the Scarborough project where the “estimate” for the subway’s cost has remained fixed since 2014 despite major changes in project scope. As a project moves through the three phases, project definition becomes more refined and the information used as the basis for developing a cost estimate is more mature. A Class 5 cost estimate is typical when starting the initiation and development phase, where the project is conceptual (0-2% design level). This an order of magnitude estimate to inform the decision of whether or not to continue to study an option. Note that the term “order of magnitude” has considerable leeway, and a change from one order to the next is a factor of 10. Saying that costs “A” and “B” are in “the same order of magnitude” gives huge scope which on projects of this nature is measured in billions of dollars. Too much past debate has assumed that minor swings in estimates might occur as designs are refined, but this is more wishful thinking and the political hope that a project will not get out of hand even before shovels hit the ground. The map below shows the location of all projects in the transit network plan. Projects will advance from stage to stage on their own timetables which are summarized in the chart below. 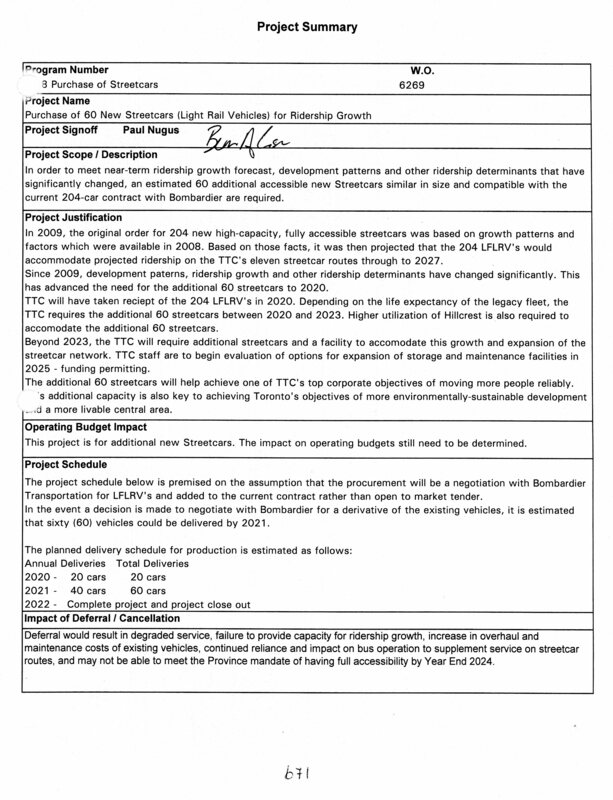 This section reviews the status of the Scarborough extension as it is presented in the city reports. Obviously this is subject to major change given provincial announcements of support for taking ownership of the extension and for building a three-stop subway. 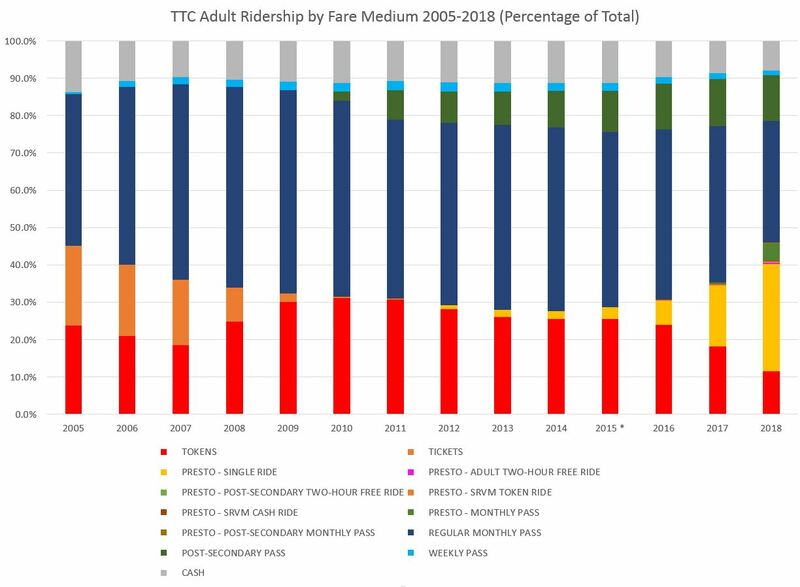 With the shift of TTC monthly passes from a dedicated swipe card to the Presto fare card in January 2019, I decided to track usage in detail as a sample size of one rider. How accurate is the tracking data? What would my riding have cost under three scenarios: monthly passes, two-hour transfer rules and single fares? How often was I unable to tap because readers were not working? My travel pattern places me firmly in the category of a heavy user of transit. Living at Broadview and Danforth, I have the choice of the Bloor-Danforth subway and several surface routes, most with frequent albeit sometimes unreliable service. Almost all travel is within the “old” City of Toronto where there are many closely-spaced routes. This is very different from the environment riders in the suburbs face for choice, frequency and trip length. For the first three months of 2019, my travels are summarized here. In the “New” rules, any tap made within two hours counts as one trip/fare on a Presto card. In the “Old” rules, TTC prohibits stopovers and changes of direction. These would trigger a separate trip/fare. The tap count is based on actual taps on fare machines and gates, and does not include transfers within fare paid areas. Overall, the two-hour fare reduced my “trip” count by about 20%, although some of those “saved” fares are a result of my knowing that I do not face an extra fare, something I have been accustomed to since the Metropass was introduced in May 1980. In other words, I would not have “paid” all 258 fares were I paying by tokens/tickets, and so the reduction to 202 would not represent a “loss” of 56 fares. Moreover, careful choice of transfer locations would shave the single fare cost by adjusting travel to minimize the need to pay a new fare. Similarly, as a long-time pass user, I have been paying a monthly equivalent of fewer fares than I would have paid with tokens or tickets. Using the fares in effect for this period, the break-even rates for passes versus tickets/tokens are shown below. The “multiple” is the number of tokens/tickets represented by the pass price, and is the trip count at which a rider “breaks even” with a pass. The effect of the severe winter weather is clear above, and my riding increased in March. Three days in January and February were “snow days” where I made no TTC trips. Even so, during the worst month and with the new two-hour transfer rules, I took more trips (measured as fares) than the multiple for any of the available passes. I have a senior’s annual pass and easily crest the break-even point of 52.2. In TTC budget discussions, some board members (not to mention management) railed against pass holders as freeloaders whose riding was subsidized by other less-frequent travellers and the city. What they completely missed is the fact that were someone like me on a pay-as-you-go basis, many of the trips shown here would not have been taken, or would have “artfully” been made without paying another fare. Optimizing one’s travel is easier where there is a dense network of routes and more choices to credibly use a transfer (e.g. for a stopover), and this technique predates all-door boarding where inspection at entry can be avoided. If the point of a transit system is to encourage travel and make it more attractive for those who were penalized by the traditional transfer rules to use transit, then the fact that I or anyone else would pay a lower average fare (calculated against those rules) shows that the policy is working. For example, a common weekend shopping outing I make would be, at a minimum, a three-fare trip under the old transfer rules using ticket or tokens. It is now a one-fare trip because it is accomplished within two hours. Moreover, I have the option of additional stopovers and greater flexibility in route choices. As tokens and tickets are replaced by Presto “Limited Use Media” (LUMs), tickets with one or a few TTC fares rather than a full-function Presto card, the two-hour fare will be available to almost everyone. All that will remain is the ability to issue a receipt for cash fares that confers a two-hour ride to bring this convenience to everyone. In all of this discussion, the core argument is that paying for transit is changing, and has been changing for years. 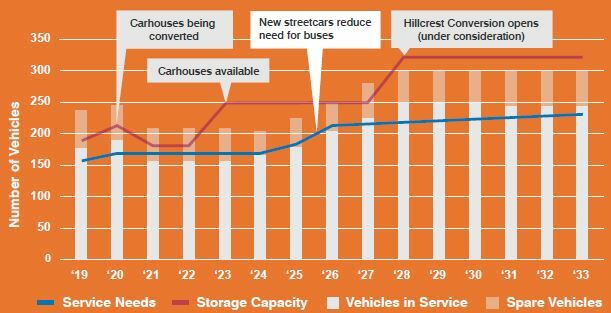 The system moves away from the nickel and dime approach of charging as often as possible to making transit attractive as a service that is simply “there” to be used, much as auto owners regard their vehicles. Some riders will pay more, some less, and frequent users will probably be better off than those who ride occasionally. The complementary part, still to come in our low-tax obsessed era, is that transit service across the city will be truly attractive to those who wish to use it as a first choice. The reliability of Presto equipment has improved quite substantially in recent months, and I encountered few cases where I could not “pay” a fare, or as a pass user, get an updated timestamp on my Presto card. On two occasions, subway fare gates were locked open because the entire station’s system appeared to be “down”: Bay Station on January 21, and Union Station on February 2. On one occasion, there was no working Presto device on a vehicle (a CLRV on Queen), but my trip was picked up when I transferred at Humber Loop. On a few occasions, the reported location did not match where I tapped, although these were usually only off by one stop or city block. The most extreme example was a tap near Broadview and Danforth that was reported as being on Roncesvalles Avenue. In another case, a tap reported a location as if the vehicle were still in Leslie Barns. These would have been a problem for “old” transfer rules or for any distance-based fare scheme. On two occasions, there was a forced transfer due to service problems, and one of these required a “walking transfer” from Queen to Dundas. These could have triggered extra fare charges under the old transfer rules, or challenges to the validity of the fare paid if I were not using a pass. My Presto card was inspected on a few occasions, but at predictable locations: Broadview, Spadina and Union Stations. Only one of these registered as a transaction in my Presto activity summary. The database of locations for stops, mainly on 504 King, only knows of stops by number, not by name, presumably as these are “temporary” locations for the King Street Pilot. The fact that these have not been updated with real location info over a year after the stops were moved says something about the dedication to clear customer information. Finally, in all of my travels, I have not seen one rider “tap on” to a vehicle in a paid area. The TTC was pushing the idea of “always tap on” as part of the Metropass/Presto roll out, but riders behave just as they always have in subway stations. The claim is that this would give better planning data, and make fare inspection (if it ever actually occurred on surface vehicles) simpler, but the TTC will just have to make do with the “taps” they do get. Many years ago, before the abolition of “Zone 2” in Toronto’s fare structure, a friend and I set out to test the limits of transfer rules that allowed for a continuous trip in one direction. This rule had an exception that allowed one to avoid payment of an extra fare by staying within a single zone even if this meant travelling out of the way on one’s journey. We began on the Port Credit Bus, then a TTC operation, a few stops west of Long Branch in Zone 3. There was a zone 3-2 combo fare, and this gave us Zone 2 Port Credit transfers, about as far remote from downtown as possible. Our goal was eastern Scarborough. The journey took us to Humber Loop, then up to Jane and Bloor, up Jane, across Wilson and York Mills (staying clear of the zone boundary at Yonge and Glen Echo), then down Birchmount to Kingston Road. At that point, many hours after we began, our transfers were finally rejected, and we paid a new fare to ride out to West Hill. In the continuing circus which is the Ford Family Transit Plan, the provincial government has advised Toronto and the TTC of its priorities for rapid transit construction. The Province is quite firm that since it will be paying for these lines, it will call the shots. This information broke in two letters dated March 22 and 26, 2019 from Michael Lindsay, Special Advisor to the Cabinet – Transit Upload, and Shelley Tapp, Deputy Minister of Transportation, together with a report from the Toronto City Manager, Chris Murray, dated March 26. These are the only projects mentioned in the letters. By implication anything else is off of the table as far as provincial funding is concerned except for whatever the subway “upload” still under discussion might entail. More about that later. The Province refers to “incongruencies between the province and city/TTC with respect to the design and delivery of priority projects”. Most of this should be no surprise given previous statements both by Doug Ford as a candidate, and rumblings from his supporters. The Province was not paying attention to, or chose to ignore, information it received or should have been able to access easily through public channels. The City/TTC should have had some idea of what was coming down the pipe over two weeks ago, but there was no public hint of what was in store even with the subway upload on the Executive Committee and Council agendas. This is a classic case of “who knew what and when”, and a troubling question of whether the direction of provincial plans was withheld from public view for political expediency. Per our meeting of March 8, we were informed that the City’s preliminary cost estimates for both the Relief Line South and the Scarborough Subway Extension have significantly increased to nearly double or greater the figures released publicly. they really were, but that their first statement was guaranteed to blow every transit plan to smithereens if it were not retracted. On March 26, they do not say they were wrong, merely that they were dealing with preliminary estimates. That is a strange position considering that the SSE is on the verge of reaching a firm design number and budget to be reported in early April to Toronto Executive Committee and Council. The agenda publication date is April 2, and it is hard to believe that a firm estimate for the SSE does not already exist. As for the DRL South, that is in a more preliminary state, but if anything the numbers already published have been rather high. Province: Three stop extension “with the same terminus point”. … we recognize that the city/TTC and province share the intention for a station to be located at Scarborough Centre. However, under the province’s preferred three-stop extension of Line 2, the project would proceed northward from the station at Scarborough Centre. Given that the TTC’s alignment for STC station is itself on a north-south axis, it is unclear just what this remark refers to especially if STC is to be the terminus of the provincial project. As I wrote recently in another article, there is an issue of equipment and storage required to allow the SSE to open with full service to STC. 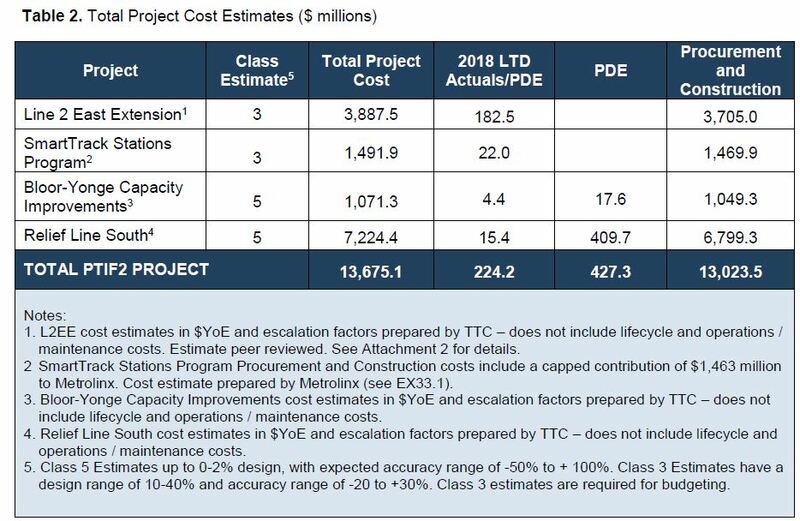 One potential source of “additional” cost could well be that works such as a new Line 2 yard at Kipling plus the rebuilding and/or replacement/expansion of the fleet are now counted as part of the overall project cost. This is precisely the sort of hidden cost I warned the Province would face when they started to understand the full scope of the TTC’s infrastructure requirements. Whether this is the case remains to be seen, but with the Province taking responsibility for delivery of this project and planning to assume the cost of maintenance and expansion of the existing subway, they (or anyone else looking at funding the SSE) will be facing these costs as “add ons”. One other concern is that there is no mention of capacity expansion for Line 2 either by way of station expansion at critical junction points nor of fleet expansion to allow more service once the line has Automatic Train Control [ATC]. City: A substantially at-grade extension from Mount Dennis westward, although there are references from recent public participation to the possibility of some grade separations. Province: A “significant portion of this extension” would be underground, an option “which has not been considered in a material way” as part of the current design. … we recognize that tunnelling options for the project have been considered as part of previous assessment, but that these options are not preferred by the city/TTC. Again, one must wonder just what the province was doing at the March 8 meeting to have so botched their understanding of the work to date. The work already done is documented on the project’s website. I cannot help wondering how much the original provincial position was a product of political posturing by Etobicoke politicians. Such a gaffe does no credit to Michael Lindsay and his team. It is no secret that there is strong political pressure from politicians in Etobicoke for the LRT line to be buried as much as possible, and it is no surprise that the Province would embrace this. Missing, however, is any reference to the portion of the line west of the Toronto-Mississauga boundary and specifically the link into Pearson Airport. Will this be part of the Provincial project? The text in this section has provoked speculation in various fora, both the mainstream and social media. Planning work undertaken by the TTC contemplates utilizing existing technology … the province would propose … a truly unique transit artery spanning the city that is not beholden to the requirements of the technologically-outdated Line 2. … we recognize that the city/TTC is contemplating a different technology for the project than that currently deployed for Line 2. It is hilarious to see Line 2 described as “technologically outdated” when it is this line that the Province plans to extend to STC. At the risk of peering into a murky crystal ball, I will venture an interpretation of what is being said here. The “outdated technology” is the current fleet of T1 trains which do not have ATC installed. Moreover, TTC plans would not see ATC operation on Line 2 for at least a decade unless the existing fleet is retrofitted. The TTC has always intended that the DRL would use modern technology, and again I cannot help wonder whether the Provincial reps were paying attention at their March 8 meeting with the TTC. This information is not difficult to obtain. They could even read my blog if they don’t want to spend time wading through official documents, but possibly it is simpler just to slag the municipal agency in a time-honoured Queen’s Park tradition. The Province wants the DRL to be completely free-standing in that it would not depend on Line 2 and the existing yard at Greenwood, but would be built completely separate from the existing subway network. Moreover, “alternate delivery methods” would be used for this project, a clear indication that this would be a privately designed, built, financed and operated line much as the Crosstown was intended to be before a deal was worked out to let the TTC drive the trains, at least for a time. 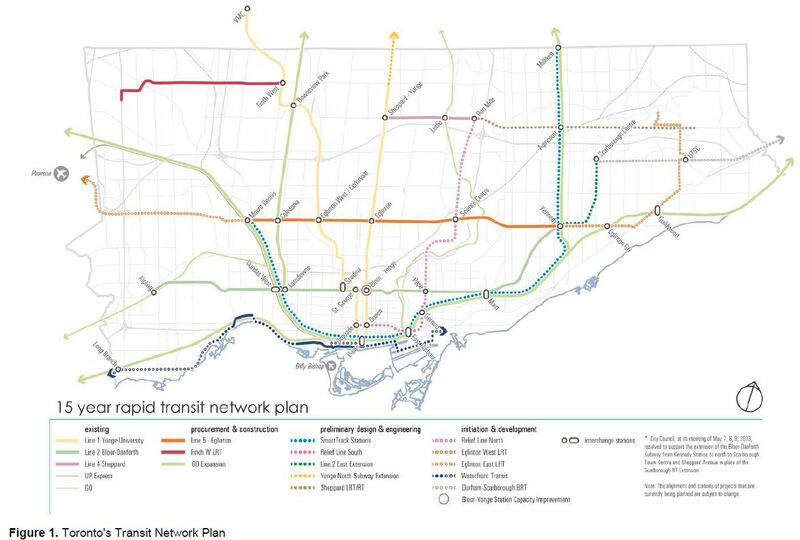 The reference to a “transit artery spanning the city” implies something much more extensive than the DRL South from Pape to Osgoode Station, but what exactly this might be is anyone’s guess. It could be a truly different technology, something like Skytrain in Vancouver (which itself has two separate technologies). The construction technique could be changed from the proposed double bore to a single bore line, especially if the vehicle cross-section were smaller. The alignment and station locations could be changed. Any of these and more is possible, but we don’t know. As this is to be an AFP project, a blanket of confidentiality hides everything. The primary provincial interest here is in getting the line built as quickly as possible with planning and design work for the YNE and DRL to progress in parallel so that “the in-service date for the extension is fast tracked to the greatest extent possible”. There is no mention of capacity issues on the existing Line 1 including the need for more trains, nor of the expansion needed at key stations to handle larger volumes of passengers. Jumping the Gun on Uploading? The March 26 letter clearly attempts to correct misapprehensions from the March 22 missive. These were presumably communicated privately at or before the March 25 meeting. The Province is supposed to be engaged, in good faith, in discussions with the City and TTC about how or if it would take control of subway assets and what that control, and associated responsibility for ongoing costs, would entail. One might easily read the March 22 letter as showing that the Province has made up their mind, and all that remains is to “drop the other shoe” with respect to everything beyond the “priority projects”. On March 26, the Province talks at length about “our priority transit expansion projects”. This has always been the political red meat in that new lines translate into votes, or so the Ford faction hopes. The myriad of details in looking after the existing system do not lend themselves to coverage in a two-page letter, let alone simplistic posturings by politicians eager to show the wisdom of their plans. The March 26 letter does not discuss any aspect of the existing system including asset transfers or financial commitments. That’s not to say the Province has not considered this, but no details are public yet. That will be a critical issue for Toronto because the degree to which the Province actually plans to pay for the existing subway system will affect future City budgets. There is a myth that fare revenues will cover off the City’s share, but we don’t actually know which aspects of subway “maintenance” will remain in the City/TTC hands. There are two separate budgets, capital and operating, but there has been no statement of how these will be divided. Although there could be a one-time payment for the capital value of the system, this begs two questions. First, who benefits from appreciation of property value as subway lands are repurposed/redeveloped. Second, what does the City do when the nest egg from selling the subway, assuming they even have anything left over after discharging subway-related debt, is used up. Another issue to be decided is how the split in ownership and financial responsibility will affect gas tax funding that now flows from both the Provincial and Federal governments, over $300 million in 2018. How much of this will Toronto lose, and what will be offset by costs the Province will assume? Eglinton East and Waterfront would, assuming a City/Province divide on surface/subway projects, lie clearly in the City’s court, while any extension of Line 4 Sheppard would be a Provincial project. Oddly, Eglinton East would be a “City” extension of a provincially-owned line, the Crosstown. The Finch LRT occupies an odd place as a surface line that for historical reasons is being delivered by the Province. Moreover, an airport extension would lie partly outside of Toronto. Who knows what the fate of this will be. The provincial letters have dropped into the Council meeting planned for March 27, and we can expect a great deal of debate, if not clarity, in coming days. At a minimum, the Province owes Toronto a better explanation of just what they intend with their view of projects. This information should not be “confidential” because we are simply asking “what exactly do you want to do”. This is particularly critical for the Downtown Relief Line whatever the “unique transit artery” it might become. SmartTrack and GO are important components because they will add to the “local” network within Toronto and could be part of the “relief” efforts that will span multiple projects. SmartTrack is a City project, and we are about to learn just how much it will cost Toronto to put a handful of John Tory branded stations on GO’s Kitchener and Stouffville corridors. SmartTrack also takes us into the tangled net of fare “integration” and the degree to which Toronto riders will pay more so that riders from beyond the City can have cheaper fares. Finally, there is the question of operating costs. The Ford mythology includes a claim that subways break even, and in the uploading schemes mooted to date, there is an assumption that Toronto will still operate the subway network and pay for its day-to-day costs out of farebox revenue. Even if that were true today, much of the proposed network expansion will not gain revenue to cover its operating cost, and Toronto will face increased outlay. There is still no proposal, let alone an agreement, about the operating costs of the Crosstown and Finch LRT lines from which we might guess at how the combination of three new lines/extensions will affect the subsidy call against Toronto’s tax base. With clear errors in the March 22 letter, the Province showed that it cannot be trusted to propose policy based on fair and accurate characterization of Toronto’s transit system. One would hope that a “Special Advisor” backed by the boffins at Metrolinx and the Ministry of Transportation might be able to avoid screw-ups. When the Province puts forward a scheme to take over part of the TTC, their rationale should be based on transparent and accurate information. Alas, recent experience in other portfolios shows that this will not happen, and dogma will trump common sense. Updated March 19, 2019 at 4:00 pm: The TTC has replied to questions I sent about the new Presto spending. There is a major change in project scope. Buried in hundreds of pages of the TTC’s Capital Budget are a few sheets on the implementation of Presto, the fare system foisted on Toronto by Queen’s Park. 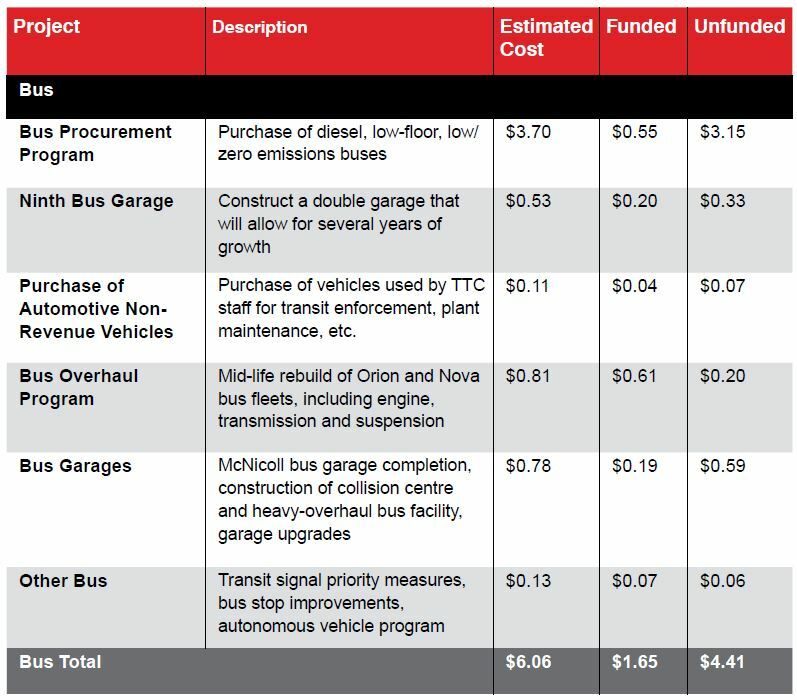 According to the project description, the estimated final cost (EFC) for the TTC would be $44 million (this is net of subsidies from other levels of government). However, as the project budget shows, $43 million was spent to the end of 2017, and a further $19.4 million in 2018. Most of the costs booked to date have been under the category of “Project Management”. The project is supposed to wind up in 2019, but there is a budgeted TTC cost of $17.3 million. And lo and behold! In 2020 there is a further $49 million. Both the 2019 and 2020 spending are net new in the budget this year, although $47 million of the 2020 amount is still considered to be “unfunded”. 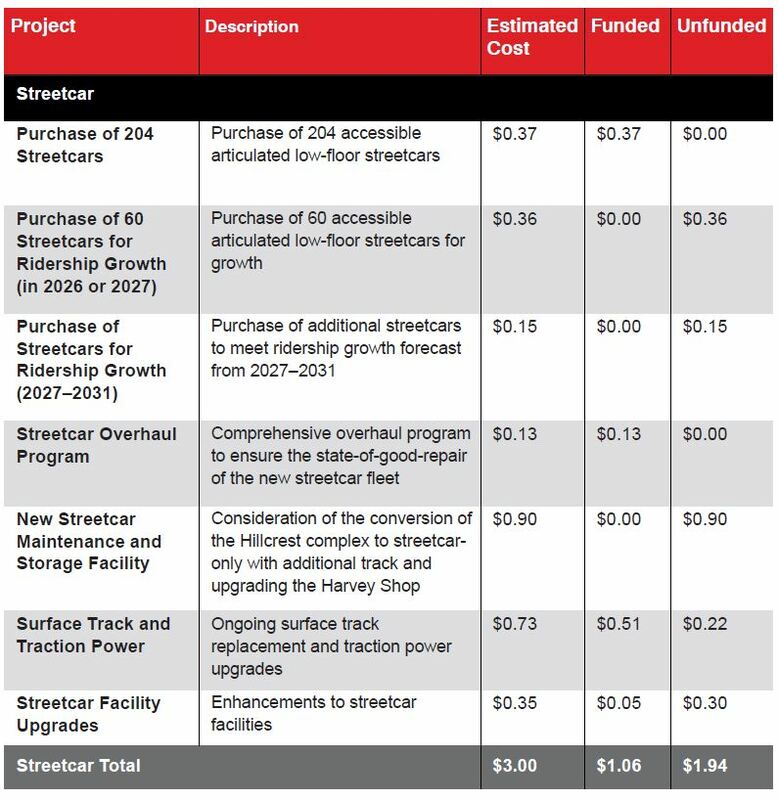 On March 5, 2019, I asked the TTC what this proposed spending was to cover considering that the Project Summary (below) is silent on this new money. And so a question for everyone who is following the Presto story: Why is there a total of $66.3 million in new money included in the 2019-2028 Capital Budget that was not there last year? What will it pay for? Will this spending ever end, or are will Toronto continue to discover costs for Presto it missed when the project to adopt this system was sold to the TTC Board and Council? A portion of 2019 added funding is to enable TTC farecard staff to continue work on PRESTO implementation (products, service standards, etc.) There is also a portion of unspent 2018 funds carried forward into 2019. Some 2019 costs and the 2020 cash flow is a preliminary estimate for the cost of an on vehicle ticket solution for buses that will allow customers to pay with cash to obtain a ticket that will allow them to pass through faregates. This is a very early estimate that was developed as part of the comprehensive list of projects identified in the Capital Investment Plan. As noted, aside from initial funds for a feasibility study this project is not funded. The PRESTO rollout was anticipated to be substantial complete in 2018 with the rollout of the PRESTO Ticket product, and solutions for cross boundary travel, downtown express travel and other PRESTO payment products. MX was unable to deliver these items, particularly PRESTO Tickets, as expected in 2018 and delayed the implementation to 2019. Resources were also added to the capital program to addresses software quality and system performance issues. Additional capital funds were requested to accommodate and support the continued work and change to the PRESTO implementation plan. A solution is required to allow cash paying customers transferring from surface vehicles (buses, streetcars, Wheel Trans) to enter non-integrated TTC stations with fare gates. Initial capital funds were added to year 2019 and 2020 as a very early estimate that was developed as part of the comprehensive list of projects identified in the Capital Investment Plan. This funding is for business case development and feasibility analysis only. We had also added funds for the development of a fare payment solution for Wheel Trans contracted taxis in the event Metrolinx/PRESTO was unable to do so. Note: At the time of publication (Noon on Monday, March 18, 2019), I await a response from the TTC to several questions on issues raised in this article. When the responses arrive, I will update the article. 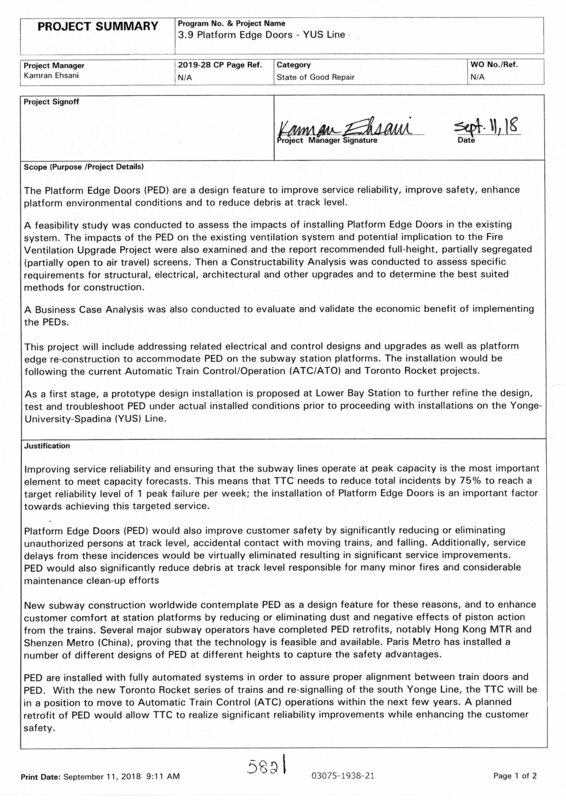 Updated March 20, 2019 at 6:40 am: The spreadsheet of major project costs has been revised to show the correct final cost for the Line 2 Platform Edge Doors project. The value under “post 2028” was correct, but the EFC originally contained the value for the Bloor-Yonge project. This change does not affect the text of the article as PEDs were cited only in that table. 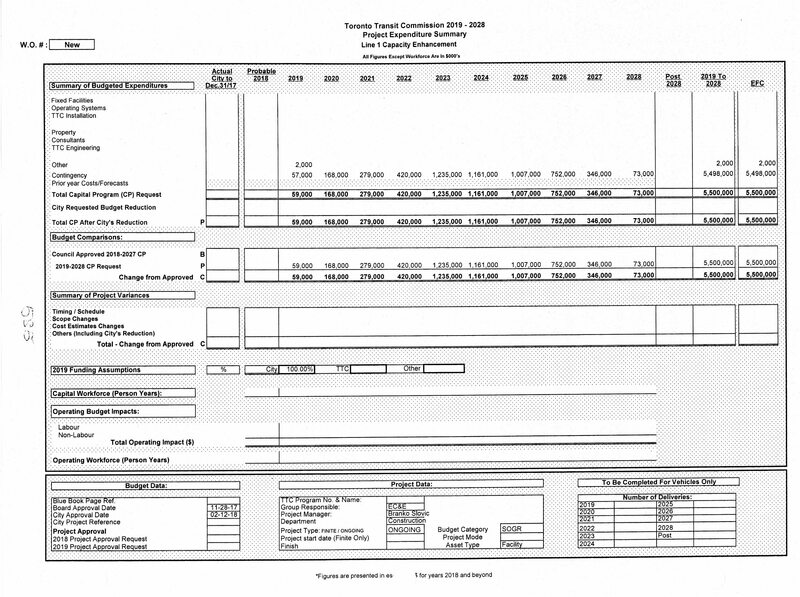 The TTC’s Capital Budget and Plan exist in a summary form in reports to the TTC Board and City Council, but there is a much more detailed version commonly known as the “blue books”. These are two large binders packed with information about capital projects. For years, I have been reading them to sniff out issues that the general reports don’t cover or acknowledge. The 2019 edition became available at the beginning of March, and as I dove into it, many questions began to fill notes especially where there are direct conflicts between materials in the books themselves, and between these details and public statements and reports. Combing through this material may look like the height of transit nerdishness, but there is a crucial underlying issue here. Cost-cutting politicians, not to mention ambitious transit managers, think that everything can be solved with a quick takeover of ownership and decision-making responsibilities. The temptation is to appear to do much while spending as little as possible. TTC and City practices chronically understate the capital needs of the transit system, and this makes a takeover appear cheaper than it really should be. Couple that with a government and its agency, Metrolinx, where detailed, long-range spending plans never appear in public, and we have a recipe for a system that will crumble from underfunding. I cannot help but feel that project timings and overall plans for the system have been shuffled around without a thorough review of the effects especially where related plans overlap. 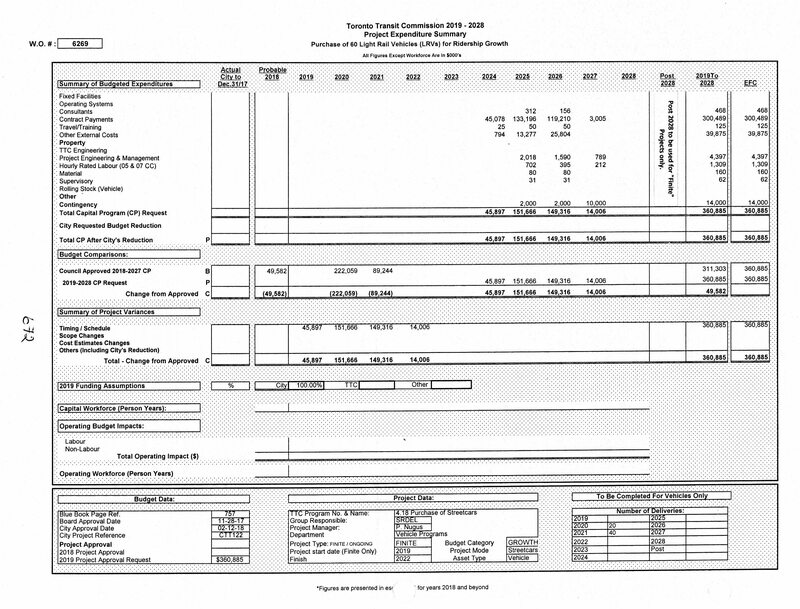 Indeed, some project descriptions contain text that does not match the timing implied by the annual budget allocations. TTC management is supposed to be working on consolidated plans for both major subway lines, although the one for Line 2 was promised two years ago when Andy Byford was still the CEO. A long-standing problem with capital budgets in Toronto, and not just at the TTC, is the overriding concern with the City’s debt ceiling. Toronto sets a target that the cost of debt should not exceed 15 per cent of tax revenue. Originally this was a hard cap for each year in a ten-year projection, but major projects in the near future made this impossible to achieve. Now the target is to stay at or below the ceiling on average. With a bulge in spending, and hence an increase in debt, in the mid 2020s, debt costs go over the line and this is “fixed” only by having years at less than 15% to make the average work out. For a capital-hungry agency like the TTC there is a problem: future projects have requirements that simply do not fit into the City’s plans. The severity of this shortfall has been understated for over a decade by three simple expedients. Project schedules in the budget are pushed beyond the ten-year mark where the related debt pressure would appear in City projections. Projects are shown “below the line” in unfunded status with a hope that revenue sources such as new subsidies from other governments will appear. Projects are omitted from from the budget completely. The result is familiar to city-watchers with annual hand-wringing about the sky falling tomorrow, while somehow we manage to pay for today’s projects. 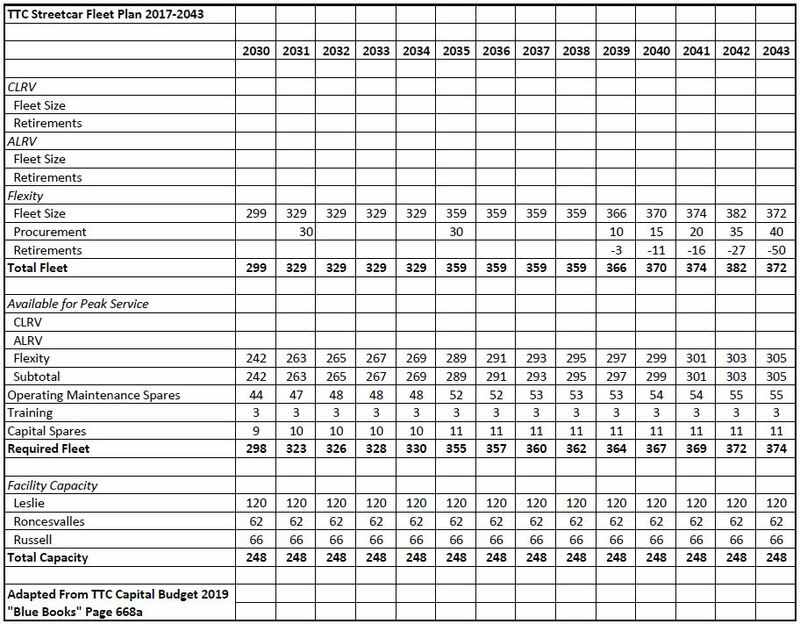 In January 2019, the TTC knocked the legs out from this with the publication of a 15 year Capital Investment Plan revealing capital needs far greater than any numbers used in past projections. What had been a ten year, $9 billion plan that was roughly two-thirds funded (i.e. had known or likely monies available) went to a fifteen year, $33.5 billion plan with only one-third funded. This is just for “state of good repair”, and any system expansion sits on top. In all of this lies a more subtle problem than simple financing. Years of shuffling projects made projected spending fit within City targets, and this served political needs to make key projects appear manageable. Overall planning, including the relationships between line items in the budget, took second place, if it was considered at all. Capital planning requires a long-term view of the city and its transit system, and decisions made today have effects reaching more than a decade into the future. Toronto continues to suffer from delays in provision of new fleets for the surface system, including the garage space needed to hold a larger bus fleet, that go back at least to the era of Mayor Rob Ford. For years, the standard response to pleas for better transit service is that there are no buses and streetcars to provide more service, and even if we had them, we would have no place to put them. This flows directly from decisions to throttle spending. Toronto faces the same challenge on its subway where decisions about the timing of spending, even of acknowledging the scope of requirements, limit the ability to address capacity problems. This is a long article focusing on matters related to fleet planning, although there are related issues with infrastructure and facilities. Key points are summarized first, with details in following sections. 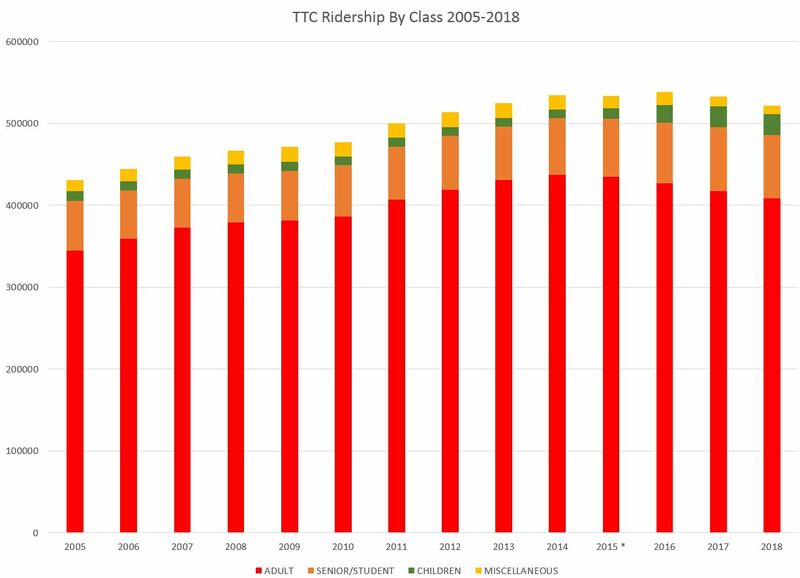 Recent discussions about TTC ridership and fare evasion included references to the numbers of riders who use each fare medium, but this was not published in detail in reports and presentations. With the availability of Presto, Adult fare payments have been migrating to that medium for the past few years. 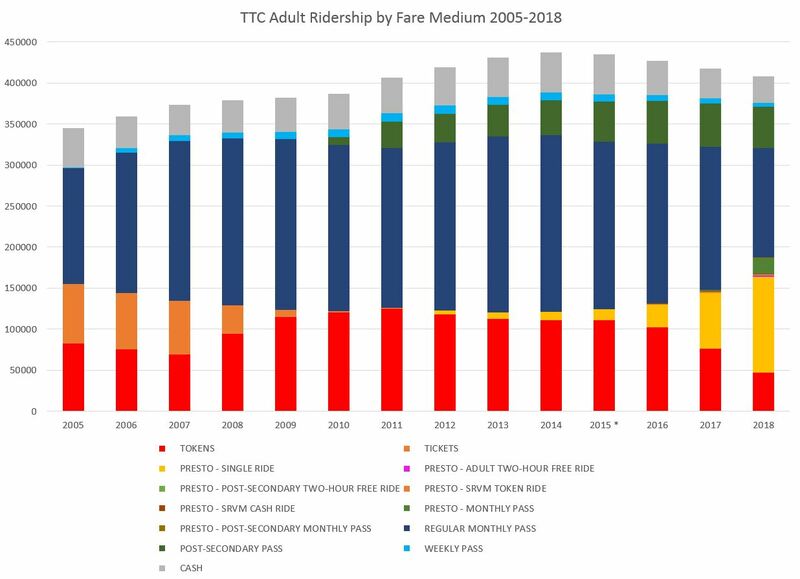 The chart below shows the number of rides by fare type and the evolution of the preferred medium is clear over the years. In 2005, the number of token fares (red) was lightly greater than the ticket fares (orange), but ticket use dropped off as this medium was withdrawn. Metropass fares (dark blue, an estimated count of trips based on user diary records) grew considerably to 2014, and then began to drop as Post Secondary passes (green) and later Presto (yellow) and Presto-based Monthly Passes (dark green) ate into Metropass usage. Weekly passes have never accounted for much of the total. Other small fractions are broken out in a separate chart below. Total Adult ridership has been falling since 2014, although this was masked in overall counts by the rise in Children’s trips with the advent of free travel. Note that 2015 is shown with an asterisk. 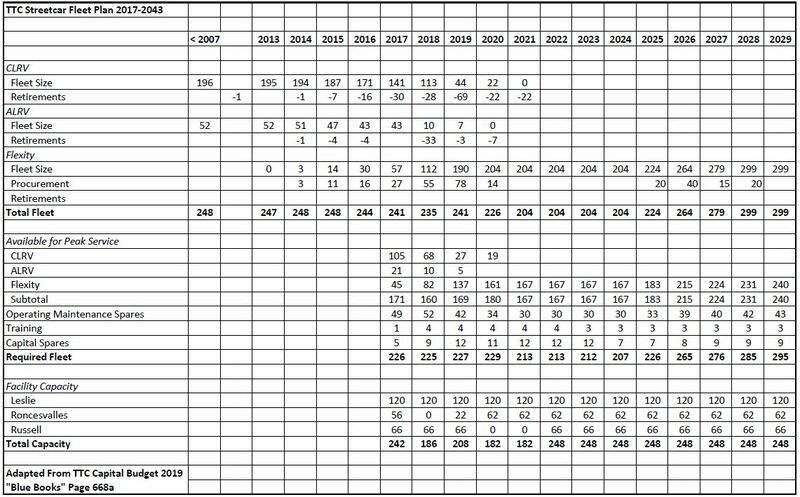 Ridership due to the Pan Am Games is not included in the totals to allow consistent year-over-year comparisons. A Presto “SRVM” is a “Single Ride Vending Machine”. Presto usage jumped substantially in early 2019 with the discontinuation of Metropasses, but this is not reflected in data to 2018 below. The bands associated with monthly passes could overstate actual ridership depending on the accuracy of diary-based estimates. 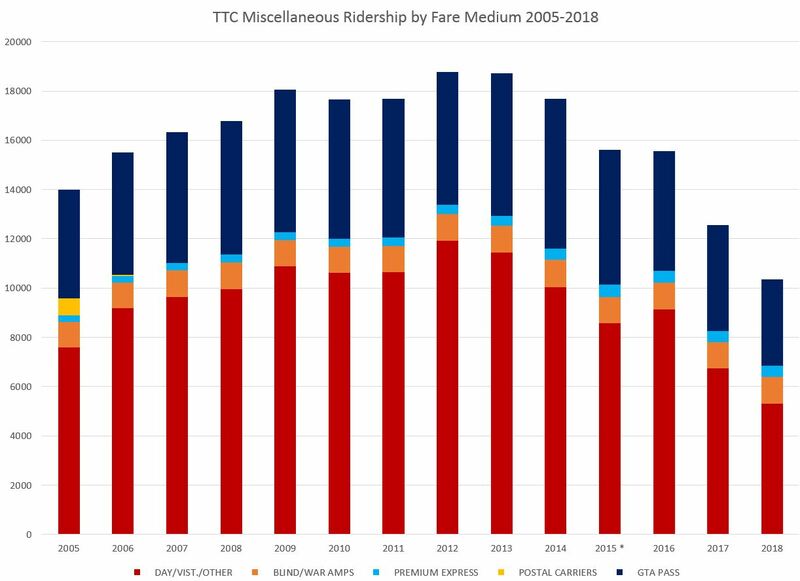 There is likely a drift between the ridership multiple (rides/pass) used to calculate the published figures and the actual ridership as discussed in my previous article about the Auditor General’s Report. The data above show ridership values, and these are reformatted below as percentages of all Adult trips. In order to make the low-usage media values clearer, the chart below includes only media for which less than five percent of Adult fares were paid with each type. 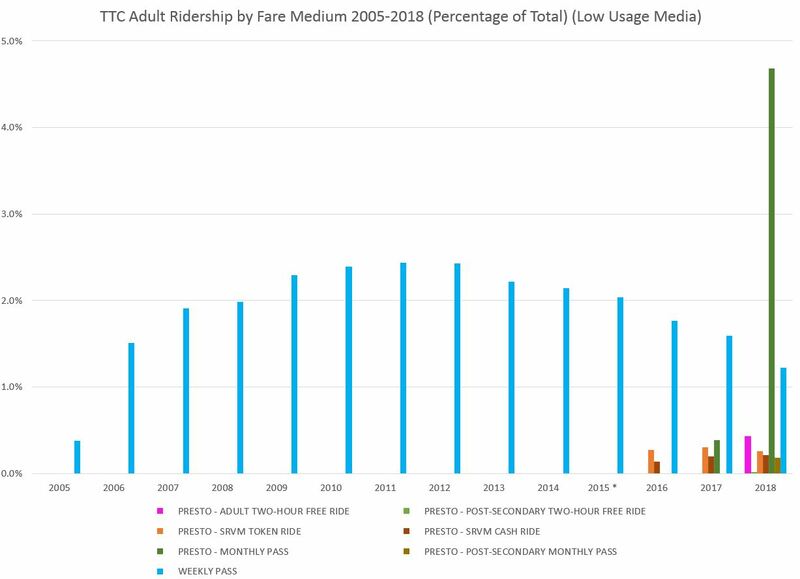 The Weekly Pass (turquoise) tops out at about 2.5% of all Adult fares in 2012 and then drops again on a clear downward trend by 2018. This pass will likely be replaced by some form of fare capping later in 2019, but there is no definite decision yet on this. The two hour fare only came into use in mid 2018, and it does not yet represent a large number of trips. Indeed, counting these as “trips” is a challenge in comparison with the previous fare structure where a “free” transfer may have been valid, or not, depending on the nature of the trip. The Presto Monthly Pass became available in mid-2018, but Metropass users opted not to convert to it in large numbers until 2019. Seniors and Students receive approxiately a 1/3 discount over Adult fares at the ticket/token rate, although their discount for passes is lower. This means that more trips must be taken by a passholder to “break even” compared with paying by tickets. 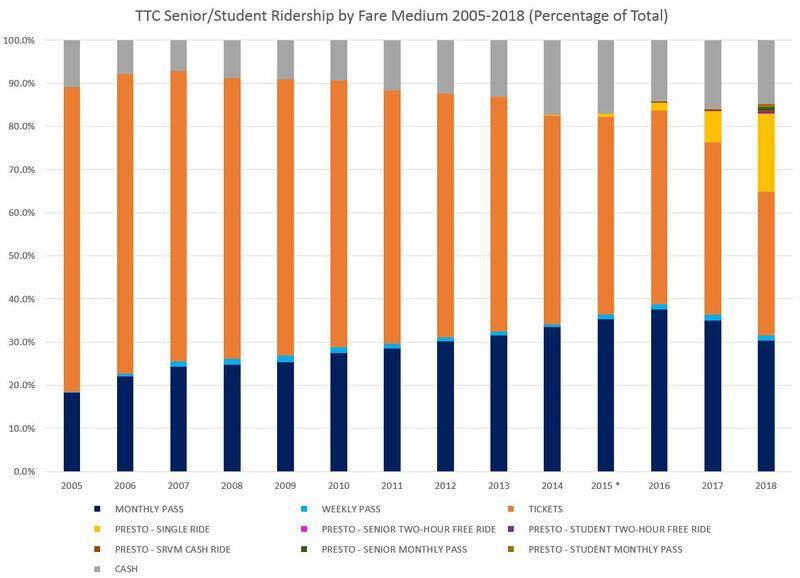 There was a steady growth in Monthly Pass usage (dark blue) up to 2016 that was since reversed by Presto-based fares. Weekly passes (turquoise) accounted for a trivial number of trips. Tickets (orange) and Cash (grey) have long been the dominant payment medium for this group of riders. Presto fares (yellow) made a considerable inroad into ticket use in 2018. 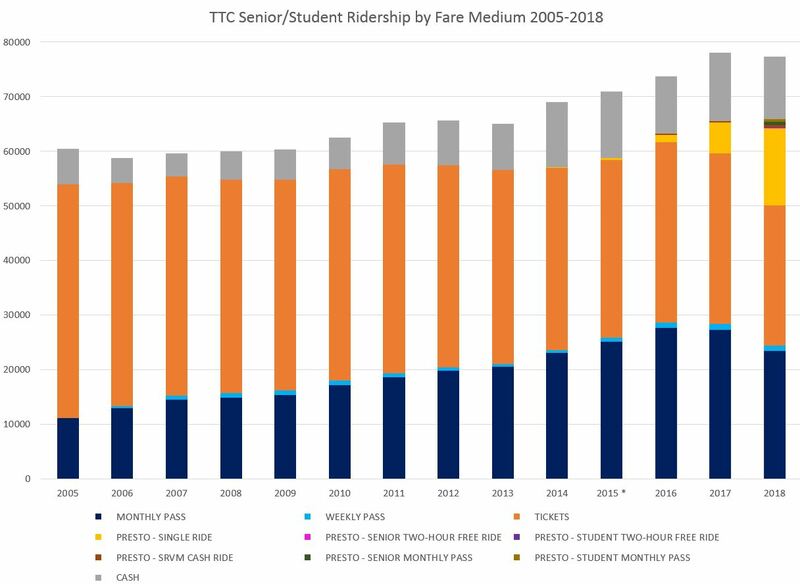 Total ridership by Seniors and Students dropped slightly in 2018. 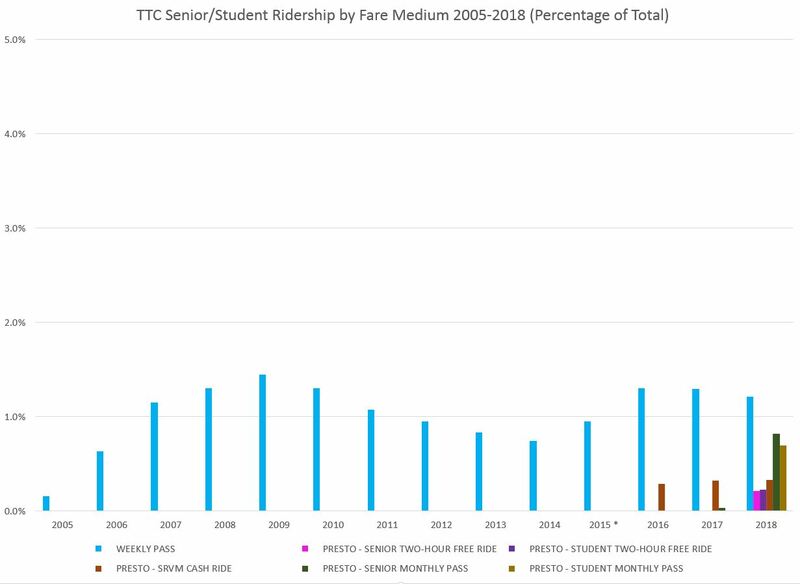 The chart below shows the same data as percentages of all Senior and Student fares. The low-usage media for Seniors and Students are a small percentage of that market, which in turn is considerably smaller than the Adult fare market. The advent of free rides for children 12 and under more than doubled the estimated riding from this group. Presto “children” (although there is some dispute about how many of these are genuine) have added a few more. Finally we come to a collection of fare media that collectively account for a small and declining amount of total ridership. Day Pass usage has been dropping thanks to Presto, and this medium will disappear entirely later in 2019. 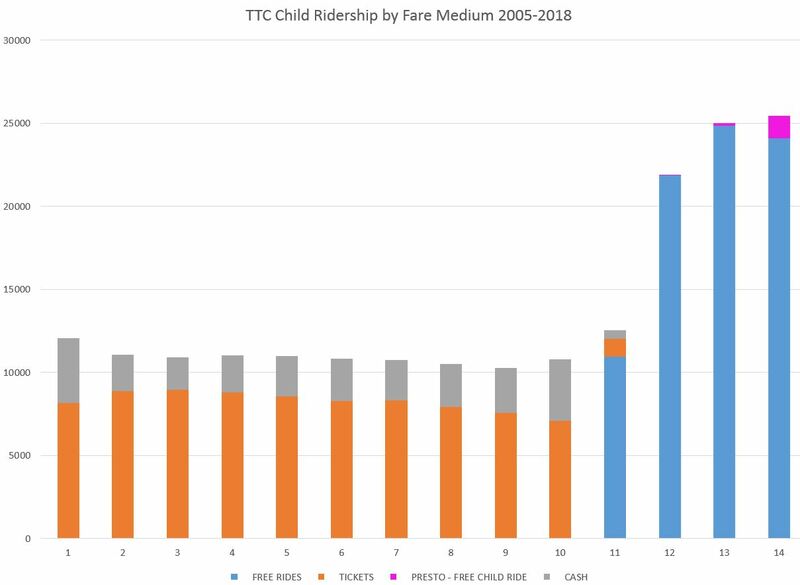 The jump of over 10 million rides associated with free children’s travel offset a chunk of the adult ridership loss as noted above. This also partly blinded the TTC Board and Senior Management from what was happening to their system overall. The decline of total ridership began in 2017, but the Adult decline had already been underway since 2015. 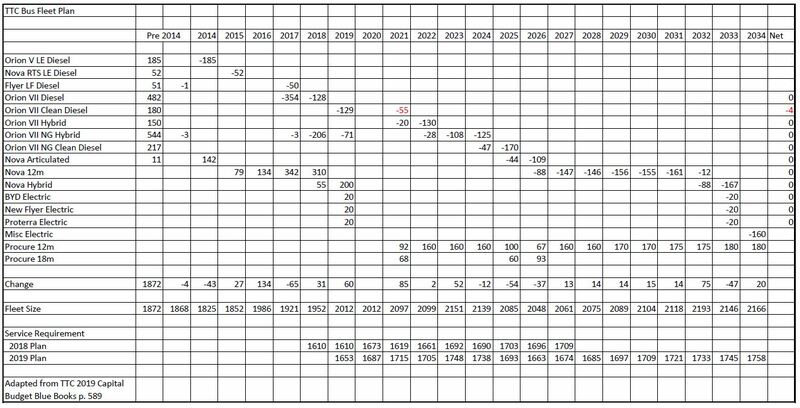 The complete set of charts in PDF format is linked below. The TTC Board met at City Hall on Wednesday, February 27. There was also a meeting of the Audit and Risk Management Committee at TTC Headquarters, 1900 Yonge Street, at 9:00 am on Tuesday, February 26 with many items that are also on the full Board’s agenda. The City Auditor General’s report on Fare Evasion was on both agendas. Given its length and detailed content, I reviewed it in a separate article. An update on actions taken by the Board is included below.